Test your knowledge of the last Time Lord and the worlds he’s visited in Who-ology, an unforgettable journey through over 50 years of Doctor Who. Packed with facts, figures and stories from the show’s galactic run, this unique tour of space and time takes you from Totters Lane to Heaven itself, taking in guides to UNIT call signs, details of the inner workings of sonic screwdrivers, and a reliability chart covering every element of the TARDIS. Now fully updated to cover everything through to the 12th Doctor's final episode, and with tables, charts and illustrations dotted throughout, as well as fascinating lists and exhaustive detail, you won’t believe the wonders that await. As Doctor Who fans, it's a fact that we spend 77% of our lives rewatching episodes of our favourite Time Lord. Well, actually, you’ve got me there - that’s a false fact. But this brand new, updated edition of WHO-OLOGY- The Official Miscellany is bursting with well-researched, fun and interesting facts, you may never have even thought of; I mean, it would be rude not to have it in your collection. The 55 Year Diary: A Doctor Who Timeline. These 24 pages delve into key dates of the shows history, summarising it in short, interesting passages. It’s amazing to see how much really has happened in the past 55 years, a favourite of mine: 21 March 1970, The theme tune ‘sting’ to emphasise the cliffhanger ending to each episode is used for the first time at the suggestion of Michael Ferguson. Everyone’s Favourite Timelord: The Many Lives and Changing Faces of The Doctor. Filled with Biographies of the actors to play The Doctor, our heroes height and even a collection of all the alternative names used throughout time - (There's 75, I counted!). The Doctor’s Best Friends: Companions & Other Allies. With the actors birthdays, reasons for leaving The Doctor and a multitude of sections devoted to UNIT. For me, the section of this chapter that stands out the most is The Lives and Times of Nicholas Courtney. Similar to the 55 year diary, this details all the Doctor Who related events to our beloved Brigadier, who is still very much missed. A Carnival Of Monsters. Have you ever wanted an A-Z of The Daleks? A Sontaran Roll Call? Or Even a list of familiar voices that helped to make the plethora of monsters send a chill down your spine? Well this part of the book is fantastic and dives into the history of, what I think, makes the show so special. Lots of planets have a north: A rough guide to Earth and other worlds. How many countries has The Doctor actually visited on Earth? A wonderful infographic provides us with the answer of 32, but you will have to get the book to find out where. The detailed list of Planets attacked by The Daleks is brilliantly researched, there's 4 pages of them, who would have thought?! A Kettle and a piece of string: Technology in Doctor Who. Whether you’re looking for 14 facts about the Whomobile or how many different things the Sonic Screwdriver has been used for, this section of the book has it. Scrambling Scribble Monsters, an essential reason of why we need the Sonic Screwdriver in the real world! Relative Dimensions: Doctor Who & Pop Culture. Outside of the fandom, our beloved show has attracted a lot of attention and become a cult icon. This section delves into music, TV and connections to famous books such as The Hitchhiker's Guide To The Galaxy. A key section for random knowledge you can dispel at dinner parties. And last but not least, The Matrix: Behind The Scenes. Ever wondered what stories name check themselves in the episode? Or how about a list of the most prolific directors in the show? A fun informative section that is a great addition to have all in one handy place. Cavan Scott & Mark Wright have provided us with this wonderful series bible, full of fun facts and key moments in Doctor Who history. This book is the ultimate gift for any Doctor Who fan. Full to the brim of 55 years of information on our favourite Time Lord, organised perfectly into 355 pages. The ultimate guide to study before attending a Doctor Who Pub Quiz, ooh would you look at that, that timed nicely, I’m off to one tonight. A real treat and a joy to see the 13th Doctor joining the historical line up. The beauty of this official miscellany is that it caters to all fans, whether you're an Eccleston-er, a Baker Boy or even a member of the Colin Club - each Doctor gets their fair share at the bat. 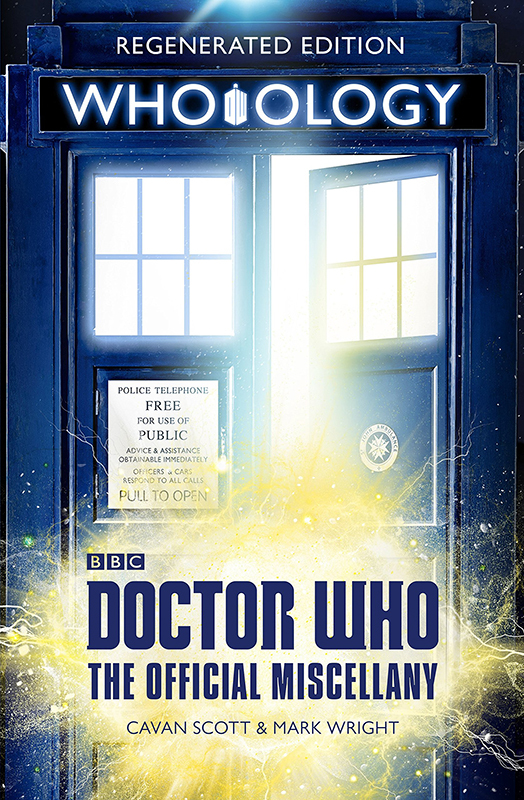 + Who-ology - The Official Miscellany: Regenerated Edition is Out Now. + Buy this book from Amazon.co.uk for just £10.53! + Follow Cavan Scott (@CavanScott) on Twitter. + Follow Mark Wright (@MWrightWriter) on Twitter. + Follow Doctor Who Online (@DrWhoOnline) on Twitter.